● Check-in time: 2.00 pm. - Your birthday discount on food – 100% . * ree service for stays of at least five days 1) Three treatments to choose *: a) manual massage b) in magneto ) aromatherapy g ) urologicheskayakolba d ) vacuum massage e) bubble baths e ) auricular therapy ( for dieters ) 2) Billiards * 3) Table Tennis *Additional free services – parking, access in every room Wi-Fi, food delivery to the room , the provision of information services for rest , taxi , barbecue , service ” Wake Up .” Paid services – transportation , business trips , babysitting, laundry, ironing, sports equipment rental . All rooms have air conditioning , mosquito nets , safes, hair dryers , modern TVs and a minibar . The rooms have satellite TV, Internet access , refrigerator, telephone , bathrobes, towels , slippers and cosmetic sets . If the client wishes An iron and ironing board. Also, CI “Eden” offers therapeutic beauty services “Vita Sana”, Computer diagnosis of visual acuity, contact lens … By treatment based tourist complex includes: Resonant magnetic therapy : disease of the nervous system , psychological disorders , behavioral disorders , cardiovascular disease , endocrine , nutritional and metabolic disorders , diseases of the digestive organs , postpartum period , bone disease and connective tissue. Oxygen foams : prevention of exacerbation of disease, especially seasonal , prevention of respiratory diseases , the prevention of diseases of the digestive system , prevention of cardiovascular diseases . Urology Vial : for men. Massage : honey, vacuum , classic European , anti-cellulite , soothing . Herbal medicine : herbal teas. Inhalation. Bubble baths : calming effect. Aromatherapy : the treatment of aromatic oils . Qualified consulting physicians. The hotel grounds are guarded around the clock . Coverage Kyivstar , MTS, Life. The complex is located in the center near the shops , near the market , near the sources of number 2s , № 18. 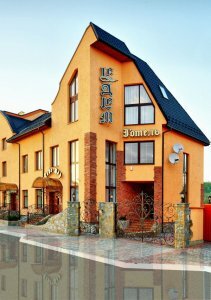 It offers a café – bar with European and Ukrainian cuisine . The café-bar large selection of alcoholic and soft drinks , wine list, the guest’s request food delivery to the room. We also have a comprehensive food menu . Our facility is equipped with nine rooms, including comfortable and luxurious rooms and cozy studio . Breakfast , lunch and dinner you can in our cafe – bar located right on the ground floor. Visit and see for yourself!